I'm still trying to find my groove...and figured this was a good time to repost my tutorial for making the cafe curtain in my old laundry room (it originally aired at The Country Chic Cottage Beach Bash). I hope the new owners like it as much as I did. :) Stay tuned for this month's Sewing 101 on Saturday. It's a great one! This beach-inspired curtain draws on a few different skills, including freezer paper stencils and VERY simple sewing. Let's get started. Step two. 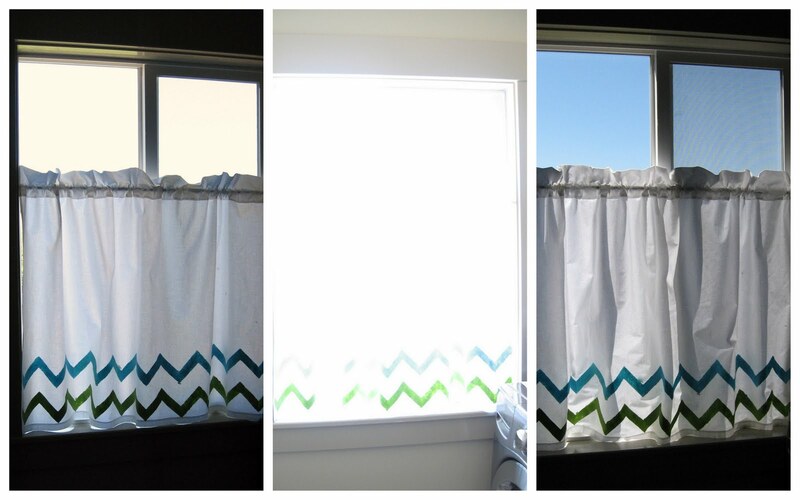 Determine the size of curtain that you need. I measured the width of my window, and multiplied that width by 2.5. This is the width you will cut of your fabric. Then, measure the length you'd like to have, and add 4 inches for the rod pocket. I highly recommend using an old sheet...some of the sewing is already done for you! Step three. Cut or rip your fabric to the dimensions you've measured. If you want easy straight edges, make a small cut at the measured mark, and then rip the fabric in two pieces. You have a bit of fraying, but the rip is true to the weave of the fabric, and you are assured a straight line. For any edges that are unfinished, sew a narrow rolled hem. I do this by folding the fabric in 1/4" and ironing it in place. Repeat, so that the unfinished edge is tucked in, and then sew 1/8" from the edge. Step five. Create the rod pocket. From the top of your curtain, fold down 4". Press into place, and then topstitch this fold down, 1/8" from the edge. To make the actual pocket for the curtain rod, take your ruler and measure 1.5" from the top. Now, sew along that line, and you'll make your rod pocket. Mix up your paint colors. I add fabric medium to regular craft paints, as a personal preference. You can just use straight craft paint if you wish. I used a fun sky blue and grassy green...perfect colors for the sea. When the paint is DRY, (trust me, you don't want to hurry this!) align your next stencil so that the pattern in continued, and press win place. Repeat until you have completed the design. I've been using these skills again to make a little curtain for the front door of our ancient rental. When we moved in , half a garbage bag was all that shielded our home from visitors at the door. Thanks for hanging in there with me! Sharing with Sugar Bee Crafts. Absolutely love these curtains and I am sure the new owners are very appreciative (I would have taken them with me! :) I hope things are coming together in your new home and getting the children settled. Beautiful curtains... and simple is always better, imho!